The Polish press has written repeatedly that Polish scientists, including Krakow-based experts, were going to the Swiss European Organisation for Nuclear Research (CERN) to repair “the machine of death,” as some of the world’s media has called the Large Hadron Collider (LHC). The Krakow Post explains what exactly local scientists will do in CERN. 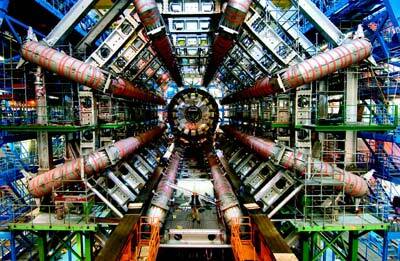 The LHC is a gigantic scientific instrument near Geneva, Switzerland, located about 100 metres underground. It was conceived with the aim of revolutionising human understanding of the material world’s structure. It is a round particle accelerator (over 16 miles in diameter) composed of superconducting magnets frozen to a temperature colder than in outer space. Using super grid computers, physicists want to use the LHC to study the smallest known particles, and possibly new particles created in the collisions, using special detectors in a number of experiments dedicated to the Collider. At the beginning of January five scientists from Krakow’s IFJ PAN went to the CERN Institute, which operates the LHC, to work on the Collider. However, they were not supposed to repair it, as many media outlets suggested, but to inspect the repairs carried out on the magnetic electrical circuits’ connections by another group of engineers. Krakow’s team is one of many to have contributed to creating and operating the LHC since 1998, each of them having a different task. The Krakow team’s task was to create about 170,000 connections between 9,500 electromagnets of which the Collider is built, and their casings. Since September’s malfunction the connections have been rebuilt and need to be inspected before further experiments can begin. Poles have contributed to the LHC in many ways: they prepared simulations of physical processes, detectors’ possible feedback, as well as data selection and recording algorithms, not to mention the very design and building of the detectors’ parts. Poles have been present in CERN since 1991. CERN was established in 1954 by 12 countries; now there are 20 member states. During the Cold War, Poles could only be observers, but currently about 30 Poles work there full time, and seven Polish scientific centres send their specialists to help operate the machine. Experiments carried out in CERN are of great importance to general technological progress. State of the art solutions applied by the physicists are adapted for improving various aspects of everyday life. Examples of this include the use of Internet and computer grids, miniaturization in electronics, low temperature technologies and CAT tomography. ← Vae Victis – Woe to the Vanquished!